The College of Law envisions to prepare lawyers who are committed to the Constitution, a representative government, and a democratic way of life under a Rule of Law that is tempered with social justice. prepare the students in the art and rigor of advocacy, where litigation is the last resort of unsettled causes, in order to secure justice in law and equity. provide the students with incentives for the development of their leadership skills and social consciousness necessary for a fuller appreciation of, and involvement in, the dynamics of social justice that animate the Rule of Law. The only law school in the province of Benguet, and one of the oldest law schools in the Cordillera Administrative Region (CAR), the CCDC College of Law is located here in Buyagan, Poblacion, La Trinidad, Benguet, just within the vicinity of the so-called strawberry fields of the La Trinidad valley. Sometime before June 1999, during a very casual conversation between CCDC President James M. Malaya (whose undiminished energy is never lost all these years) and among faculty members of the CCDC Graduate School, the idea of putting up a CCDC College of Law was introduced by the late Atty. Romeo G. Gumpic (may he rest in peace!). At that time, Dean Gumpic, or Sir Romy as he is most fondly called was not yet a lawyer; he was then the Vice President for Finance and Dean of the College of Accountancy, he being a Certified Public Accountant (CPA). CCDC President James, Dean Romeo and the rest of the “gang” recognized the need to provide quality yet accessible College of Law education to help produce competent lawyers from Benguet and the Cordillera region. From those discussions, they then prepared the necessary documents and presented the proposal to establish a CCDC College of Law before the CCDC Board, chaired by President James M. Malaya. The original proposal was to have College of Law class schedules that will cater to the needs of working students, both in private and public institutions who usually get dismissed after five o’clock (5:00) in the afternoon. These class schedules, known then as “executive class”, would have accommodated, as it did, those working students in the far away municipalities of Benguet, Cordilleras, and including other regions. United in spirit by their zealous hearts and passionate determinations, The CCDC administration immediately tended to the requirements to open a legal department of CCDC. Eventually, in June of 1999, the CCDC College of Law opened, accepting its first freshmen enrollees. Thus began in CCDC, the tedious task of bringing quality law education closer to the students of Benguet and the rest of the Cordilleras, and the more tedious yet exciting task of producing lawyers of integrity and competence. For the record, Government Recognition No. 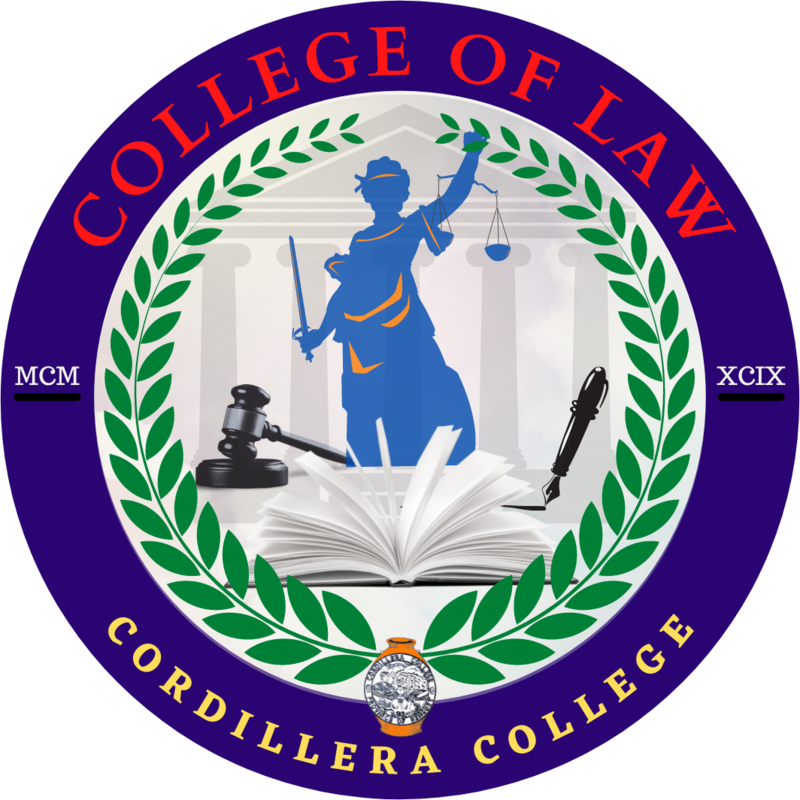 03, S. 2002 was issued on April 15, 2002, thus officially recognizing the CCDC College of Law/legal education department. The original purpose of the CCDC College of Law was served and is still serving, that is, to cater to the needs of those interested to complete a law degree but could not attend the regular class schedules offered by most law schools in the region mainly due to conflicts with work schedules. From humble beginnings, the first CCDC College of Law freshmen class in 1999 consisted of only one section of thirty six (36) students. Infamously known as the “executive class”, they met every evening of Fridays, Saturdays and Sundays, cajoled, challenged, and sweet-talked by the CCDC College of Law original professors, to wit: Judge Rodolfo U. Manzano, Judge Agapito K. Laoagan, Judge Nelsonida T. Marrero, Judge Joseph A. Patnaan, Judge Adolfo R. Malingan, Prosecutor William T. Bacoling, Atty. Jose M. Molintas, and Atty. Romeo L. Erece. These original professors of the CCDC College of Law joined the CCDC faculty unmindful of any per diem the CCDC administration can bounce them. They joined not because of the money but because of their love for teaching and learning the very beautiful music of the law. In the year 2000, the then freshmen students moved a year higher and paved the way for the creation of the sophomore section until finally, as the years went by until 2003, all four year levels of the CCDC College of Law were completed. Of the 36 freshmen, five (5) were awarded the degree of Bachelor of Laws during the first CCDC College of Law commencement ceremony in March 2003. And of the five graduates, three (3) completed their degree from first year to fourth year in CCDC College of Law while the other two (2) were transferees. Atty. Romeo G. Gumpic, one of those who conceived the CCDC College of Law, was part of the 1st batch of CCDC College of Law graduates in 2003. He later on went to become the CCDC College of Law Dean (4th in the order of Deanship succession) in 2010 until August of 2013. The CCDC College of Law Library was established in the Saleng building of CCDC. The College of Law Library, despite its modest means, currently has in stock the latest volumes of SCRA and books about the major areas of law, including political & international law, labor law, civil law, taxation law, mercantile law, criminal law, remedial law, and legal ethics. The Law Library also features a number of treatise and periodicals, and a growing collection of international and comparative law materials. Looking back, it is always heart-warming and amazingly wonderful to recall that early on, books in the Law Library were from the CCDC College of Law faculty and members of the CCDC Board, gratuitously given just to be able to comply with the requirements of the Legal Education Board (LEB). With a national passing rate of 20.71%, our CCDC College of Law very proudly had its first lawyer by 2003 in the person of Atty. Jeoffre A. Falinchao, who took the BAR together with four other barristers. By 2004, the national passing rate increased to 31.61% with two new lawyers, Atty. Cipriano O. Dalay-on and Atty. Romeo G. Gumpic. Since 2003, CCDC College of Law already produced more than forty (40) lawyers who are now employed in different sectors, both in public and private. A number joined the Judiciary and Department of Justice (DOJ) as Special Agents of the National Bureau of Investigation (NBI) and as Government Prosecutors, commonly known as Fiscals. There are those with the Public Attorney’s Office (PAO), the Department of Education (Dep-Ed), and other government offices, while more are in the private practice of law. Others are humbly yet graciously in politics and private practice combined, and yet a few would like to remain incognito, maybe bidding their time, waiting for better opportunities. And so, through the years, the esteemed graduates of the CCDC College of Law who are now lawyers in their very own right are: Atty. Frenzel A. Ayong, Atty. Simpson T. Baldo, Atty. Edna P. Dupo, Atty. Perry Ross T. Yodong, Atty. Nover B. Singgangan Jr., Atty. Kevin C. Cabal, Atty. Stanley O. Dalayon, Atty. Sebastian G. Tayaban, Atty. Johnny D. Waguis, Atty. Muhlis S. Bai, Atty. Florendo L. Leung, Atty. Allan C. Sacpa, Atty. Domer B. Tadeo, Atty. Henry B. Rosito, Atty. Penelope B. De Ausen, Atty. Sanchez J. Mangsi, Atty, Jonjon B. Amcay, Atty. Myra A. Anod, Atty. Arnel G. Ramon, Atty. Galao G. Lomioan, Atty. Jemen A. Mateo, Atty. Carol S. Dup-et, Atty. Joefer B. Baggay, Atty. Gerard D. Babate. As we continue the count, the CCDC College of Law made its most excellent record to date with twenty (20) passers out of 59 takers during the 2016 BAR examinations. That is 33%. In the list are: Atty. Manuel A. Bacduyan, Atty. Jessica B. Balawis-Gaano, Atty. Priel P. Balnao, Atty. Juvilyn E. Bandiwan, Atty. Grail P. Brioso, Atty. Melanie F. Bumacas, Atty. Chester S. Cayabas, Atty. Richard P. Dumapis, Atty. Reynaldo M. Gaano, Atty. Esteban C. Gondales, Atty. Imelda D. Guidangen, Atty. Jeeka G. Kimmayong, Atty. Michelle Joan S. Maguen, Atty. Rhea B. Maguilao, Atty. Darwin P. Marcos, Atty. Marcelli T. Merino, Atty. Maria Corazon P. Ocharon, Atty. Richard S. Piaga, Atty. Victor B. Singa Jr., Atty. Switle Mae A. Tamang. To be sure, we will be counting in the years to come. While they would like to remain anonymous, behind the successes of these CCDC lawyers include Atty. Jose M. Molintas, CCDC College of Law’s first Dean or Officer-in-Charge (from 1999 to 2000). The late Judge Rodolfo U. Manzano then took over as Dean (from 2000 to 2005). He was replaced by Atty. Raul M. Molintas (from 2005 to 2010), followed by the late Atty. Romeo G. Gumpic who became the fourth CCDC College of Law Dean (from 2010 to August 2013). Dean Gumpic was succeeded by Atty. Malcom P. Bacuso, the fifth Dean (from October 2013 to December 2015). Our present and sixth Dean, Atty. Miller E. Quintin Jr. assumed the leadership in January 2016 when Dean Bacuso was appointed as Labor Arbiter of the National Labor Relations Commission (NLRC). While the CCDC College of Law takes pride of its humble beginnings, it will surely strive to soar higher. It has stood the test of time, and it will stand the test of time. This we know, because the CCDC ADMIRALS (Administration, Mentors, Instructors, Alumni, and Students) – the instructors of the CCDC College of Law – do work together in achieving the goals, missions and vision of CCDC.